Great Story Mark…as a huge baseball fan and one who was a huge supporter of the Jays…may I just say that Joe Torre is an ***. Glad you guys got to bat with them though. I’ll never go to Yankee stadium but I love it at Shea. Rock on Mark!!! As a HUGE Baseball fan(and most importantly a DIEHARD Phillies fan) myself, and of course a fan of yours, I must say this is GREAT STUFF! Ironically, my initial connection to you, Creed and Alter Bridge is through baseball. My cousin is Mike Di Felice, who is a MLB Catcher. He’s playing in the Mets organization this year; but he was playing for the Royals, when you threw out a first pitch at a game there, so it’s possible that the two of you met. Anyways, he turned me on to Creed when I spent a week with him and his family a few years ago…it was ALL we listened to ALL week!!! We don’t get to see or talk to each other much, for obvious reasons; but I’m sure he’s listening to Alter Bridge these days too. It was SO exciting to see you guys perform at the All-Star Game; what a thrill that must have been, and what a GREAT show you put on. that’s a great story….I just can’t see Torre being so mad though. Maybe he should get like that a little more to put some fire under the Yanks. Then again, I can’t stand them so maybe not. I look forward to reading your posts. Great to see you in action and havin fun, Would love to see more pictures! lots and lots of kisses and hugs. Mark, I’m a huge fan of yours, but even a larger fan of CREED. I’m too darn old to be following new bands, I’m basically stuck in the 80’s. Creed was the first band I listened to that did not play in the 80’s. Creed just blew me away. I’ve been a KISS fan for about 28 years, been their through thick and thin, and it was very thin for several years. I really thought Creed would be the next band that I would listen to, for at least the next 25 years. I do not mean any disrespect to you or Myles, but it is time to get THE BAND BACK TOGETHER!!!! I know that their are some bad feelings between members, I am aware of things that the band members had experienced leading up to the break-up. I was even at THE SHOW in Rosemont, IL. I saw the pi$$ed off look on your face throughout the show, while I was in disbelief. Prednosone?!? YA, RIGHT!!!! I would have been happy with some what of an apology, I would not have sued you. Creed in an altered state is MUCH BETTER than almost all bands that are or are not in a similiar state of mind. I see some of these new bands, they S*CK. The more of these bands I see or hear, the more I admire what geniuses CREED was. I hope you really read this, I actually have a lot more to say to you. I hate to see you and the rest of the band WASTE the prime years of your career. mark i am unbelievably excited about the news i just got. You guys are coming to Evansville, IN!!!! Gonna try real hard to get backstage. see you then dude! hey mark!! !always keep up the good work..cause for me your the best among the rest >>>>just always take care of your self and for the member of the band of alter bridge>>im the number1 fan of MARK TREMONTE …..
hey Mark!!! some of my friends think that u dont reply peoples comments and u have someone else do it for u, but I tell them its really u, I’m right aren’t I? You’re the best guitarrist of the world!! When Alter Bridge will come to Brazil?? I would like to see you playing for us!! hey man hows it going .i just want to say how u inspire me to play the guitar your honestly a riff GOD!hopefully alter bridge comes to New Zealand i memba wen creed came an i went to see you .96 -97 im not to sure.it rocked .my dream is to be in your shoes playing on stage SHREEDING!! !i love your music mark .you keep writing it an il keep learning it.it would be a honour to hear from you.#1 fan!rock on!an hopefully i see you in NZ,christchurch soon .cheers mark .BRAD. peace. Hi Mark, it’s Karen, (check out the August 24th email under the 2beach4us5 address). I’ll give you an obscure question, for Jake: when you greeted your fans after the show in Beloit did you meet us backstage, right next to your tour bus, or in a dimly lit parking lot?…. that is if you can remember! We will be at your Youngstown concert on 10/29….should we just bring you a disc of the fabulous Beloit pics? By the way, I need another pic with you because my eyes were closed and we were so excited, we didn’t even use a flash…I guess we were a “little gitty” to meet you. 🙂 I wish you the best on your tour, now I have to prep for my “tour” in my classroom….from the Kindergarten teacher that rocks. hi mark! i just wanna ask if you’ll be having any concert here in asia. especially here in the philippines. filipino people love alter bridge… by the way, my name’s Ruther. 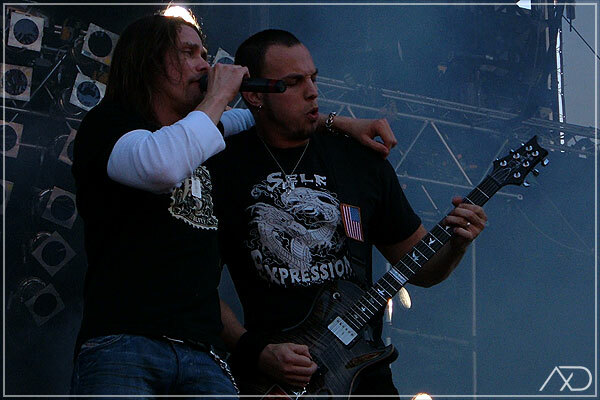 all of my friends here in baguio city are mark tremonti addicts and alter bridge addicts as well…. i hope you’ll read this soon. you rule!!!! keep rockin’! You are the best guitarist ever! I have two pictures of you in my room. I want to get a Tremonti PRS. The CD rules, I have the Creed ones too. I live in Saskatchewan Canada. I was wondering if on alter bridges website, to become a member, because I live in Canada, I can’t join, are you guys planning on making that available to Canada. I have about every video of Creed and Alter Bridge performing live or the music videos. Someday if you guys go to like Calgary for a concert, be sure to tell me, I would love to drive up there and see you guys. I am only 13 but I am in a band already with my friends, I play guitar and my best friend Josh plays the drums, he is amazing already, Travis plays bass. I can play Guitar, Bass, Drums, Piano, and Alto Saxophone. I definately prefer guitar. You biggest fan ever, Lonnie Hunter. Oh and do you have like MSN or anything like that so I could put you on mine? God Bless, and Rock On! Mark I miss you terribly. Even though I like Alter Bridge alot I ache for the Creed days. I will buy any CD that you release….but please I’m begging you down on my knees and crying PLEASE COME BACK TO BOSTON…and please settle things with Stapp. Dont say no looking back because forever without creed is the sadest thing in the world to me. Miss you! Miss Creed! Will support you always no matter what you do! Cutie! hey mark, how are you doin’? i am from argentina, look how far your music reachs. i wanted to know when are you going to record a new cd, the first one was so good that i can’t wait till the second one. also i wanted you to know that i play the guitar since i heard the with arms wide open’s solo,it really touch me. Please post more lessons, they are great. hey mark, how you doing, i’m only 15 and i’v seen steve vai a incredable guitar player and i’v seen satch who i think is amazing……but you top them both, i think that you are faster, better, and much much more musical your solos and riffs are amazing, i hope that i can be like you someay, i own currently a epiphone explorer with EMG’s a Jackson RR3, Fender strat and a les paul copy, i play about 2-3 hours a day i hope someday to be as good as you, you inspire me. thanks! Seems that Jason Grimsley turned out to be a hypocrite, liar and a cheater. Then he decided to name names in an attempt to save his own hide. Hey there Mark… not sure when you checked this last but I just had to ask… seeing that you met Jason Grimsley and Chip above me has already chimed in, what DO you think of his release from baseball after all his years? When is the band coming back to Chicago or in the area for another concert? I’ll keep checking and by the way, Have a great summer! G?day Mark. My name is Wesley Fuller and I live in Perth, Western Australia. I was wondering if Altered Bridge is coming to Australia any time soon. Also- I was wondering what the pyramid that the band makes on the inside cover of the ?Weathered? cd- I think it means something- because it means something very specific to me in regards to my own songwriting. I have written a solo album titled ?Enemies in Trinity? which draws a lot of its themes from the Creed song ?Bullets?. I use a triple rectifer and I still remember the first time I heard one for the first time. I would like to get a 1306 t-shirt like the one you?ve got. Does it?s meaning have anything to do with cracking ?base 10?? Lastly- I was wondering what your thoughts were on Marilyn Manson? He?s been giving me headache amongst other things for a while now. He can be in two places at once it seems. I?d love to hear what you think. Do you think your hometown team will take it all the way? I’m cheering them on even though the cardinals are a tough team to beat. Go Tigers!! !